Adjustable electronic timer relay - 2 timing ranges (2 different relays) - 2 timed contacts/1 instantaneous contact - 3 A.
Pluggable on the following sockets : SVB, SPVB, SVDL, SPVDL et SRDL 4.8. Two timing ranges (2 different relays) cover a timing range from 0.20 sec. up to 75 min. Timing range switch and adjustable potentiometer on front face. 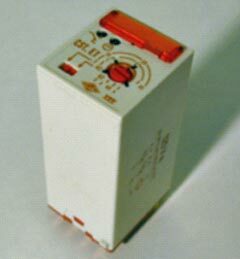 Red LED indicating the status of the timed contacts and green LED giving the timing status.
. CSTC relay with specific timings.